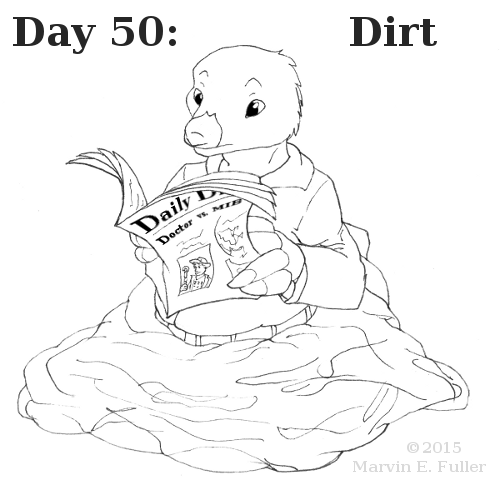 For your daily dose of dirt, try the Daily Dirt, your number one source for made-up news. "Man Cub Joins Fight Against Khan" "Doctor Hacks MIB" "Great Scott! It's 2015!" Making molehills out of mountains every day! Well, whaddaya know? I'm halfway through this Sketch Series. I'm doing rather well, if I may say so myself. Don't you think I'm doing well? I wonder how well the others are doing. If only those poor moles didn't have to come to the surface to read... but lights, in a tunnel? Unheard of!